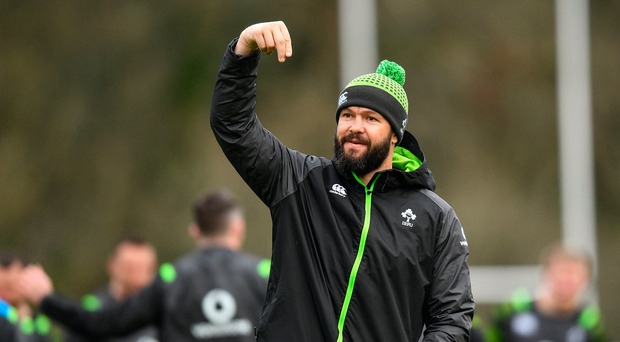 Former England prop Alex Corbisiero thinks that Ireland assistant coach Andy Farrell is a 'leader of men' who would be well suited to succeeding Joe Schmidt as head coach. The former England defence coach has been involved with the Irish set-up since the summer of 2016, having previously worked under Stuart Lancaster in the build-up to the 2015 World Cup. Ireland boss Schmidt is contracted until after the next World Cup, and has hinted that he may return to New Zealand therafter. Farrell would be a contender to step up to the head coach role, and his former player Corbisiero thinks he would make a fine replacement for Schmidt. Speaking to The Left Wing, Independent.ie's rugby podcast in association with Laya Healthcare, the former England star gave a glowing recommendation of Farrell - and even squeezed in a Game of Thrones reference. "He just speaks well," Corbisiero said. "He is a leader of men. If this was a different time, or Game of Thrones he would be leading the charge! People would be raising their banners for him. "As much as I'm glad to see him do well in Ireland, selfishly I'd like to see him get stolen back to England, whether it be England or a club," he continued. "He speaks so well, he can galvanise a team. You respect him. His attention to detail is amazing - I can see why him and Joe get on. "As a coach, I have a lot of high praise for him. As a coach, I don't have any criticisms of him. The Left Wing: Why England need a bit of arrogance and is the Lancaster/Farrell partnership the future for Ireland?